Adamski is the artist name of Adam Tinley, one of the key British figures of acid house. Born in Hampshire in 1967, Tinley was initially inspired to play music by the punk movement. However, with the boom of post-punk and electronic music by bands like Depeche Mode, he started dabbling with electronics, soon becoming a main feature on the rave scene in the late 80s. Not only did he release the first rave record on MCA – Liveanddirect, a collection of tracks recorded at parties in England and Ibiza – he also produced hit singles "N-R-G" and "Killer", the latter of which reached #1 and launched the career of guest vocalist Seal, before releasing several more successful solo albums and singles. Today he lives in Ramsgate, Kent, and remains an experimental dance music enthusiast – he created a new microgenre called threestep based on waltz’s 3/4 time signature. Recently, he’s collaborated with artists like Lee "Scratch" Perry, Asia Argento, Mercedes and Rowdy Superstar (from Atari Teenage Riot). We asked Adamski Actress’s most pressing questions. Dazed Digital: What inspired you to write ‘Killer’ with Seal? What I do know is that I’d been introduced to Seal in 1989. He’d asked a friend to show him what was going on in music at the time, so this guy took him to a rave I happened to be playing. He really liked what I was doing so he gave a friend of mine a tape, and I really liked his voice and it just happened from there. I gave him a choice of different tracks and he chose that one. He had these lyrics that he’d written that fitted really well, but the label wanted a chorus. So he went away and came up with this 'Solitary brother…' bit and that was that. I thought the chorus was a bit cheesy at the time, but when I was living in Berlin a lot of people from east Germany told me it was like an anthem for their freedom. DD: What was the hype like when you started to get famous? Adamski: Before the 'Killer' thing I’d been getting a lot of attention because of playing these illegal raves around the M25. Those things were revolutionary. The music sounded like it was coming from outer space. A really proud moment of mine was playing at a rave with 8,000 people and getting back into London after we’d stopped partying to find the News of the World had published a front page story about it! After I crossed over from the underground to the mainstream things happened a bit too fast. When 'Killer' went to number one, I was still getting my rent paid by the council. The Jobcentre had put me on this Enterprise Allowance Scheme. It lasted for a year, and you got more money than being on the dole, but it meant you were self-employed. Basically it was just a way for Thatcher to fiddle the unemployment statistics. To get on the scheme you had to watch these two videos: one was about a woman with a successful mobile hairdressing business; the other was about this man whose chocolate business was a failure because his chocolates kept melting in his garage. I found it quite funny. I became a ‘professional keyboardist’ to qualify for my allowance. "The government was scared of rave. All of a sudden thousands of people were going out and doing hard drugs and setting up massive parties. Also, they probably didn’t like the fact people were making a lot of money out of it"
DD: How did Margaret Thatcher and the Conservative Party influence rave culture? Adamski: Well for starters, there was the Criminal Justice and Public Order Act of 1994, which banned people from dancing to repetitive beats in groups bigger than three. The government was scared of rave. All of a sudden thousands of people were going out and doing hard drugs and setting up massive parties. Also, they probably didn’t like the fact people were making a lot of money out of it. Then again, there was this ’Thatcher’s children’ entrepreneurial element to it too. People were promoting raves, selling ecstasy and starting radio stations. It was like anarcho-capitalism, all love and hugs on the dance floor and people with shotguns and bulldogs behind the scenes. All the same, I still loved it. DD: What legacy has rave culture left? Adamski: I don’t know. These days a lot big American artists seem to be using beats that even people in the early 1990s would have thought were just embarrassing, and great electronic music only seems to appear in spurts. I don’t really follow other people’s stuff because I’m into my own thing too much. The last record I bought was Cowboy in Sweden by Lee Hazlewood. Such a great album – 'Leather & Lace' makes me cry. That said, instrumental grime seems really interesting. It sounds like its environment, whereas house just doesn’t seem to have progressed, and I’ve got no time for anything like that. For example, I hate indie pop and all that stuff that tries to sound like rock bands from 20, 30, 40 years ago. What’s the point? It sounds like a parody. That’s how I feel about some house music. And look at that New Rave thing that happened a few years ago. They thought a rave was 30 people in a nightclub. 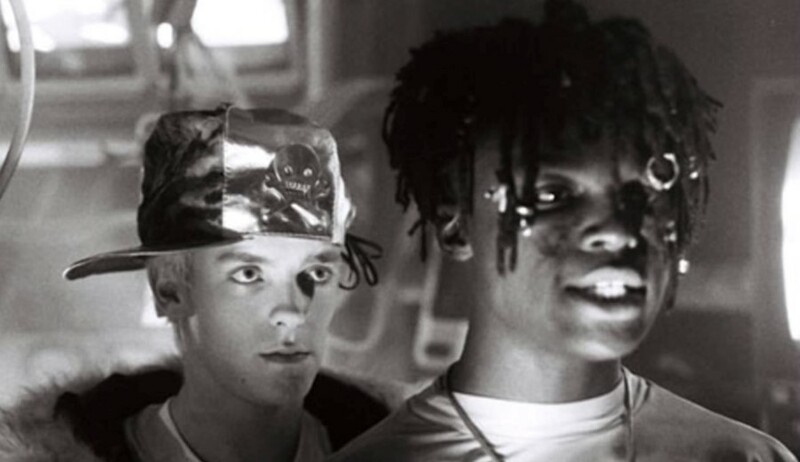 When that scene was kicking off, people used to ask me about what the original rave scene was like, so I used to tell them people wore cornflake boxes over their heads, and they’d believe me. They didn’t know what they were doing.